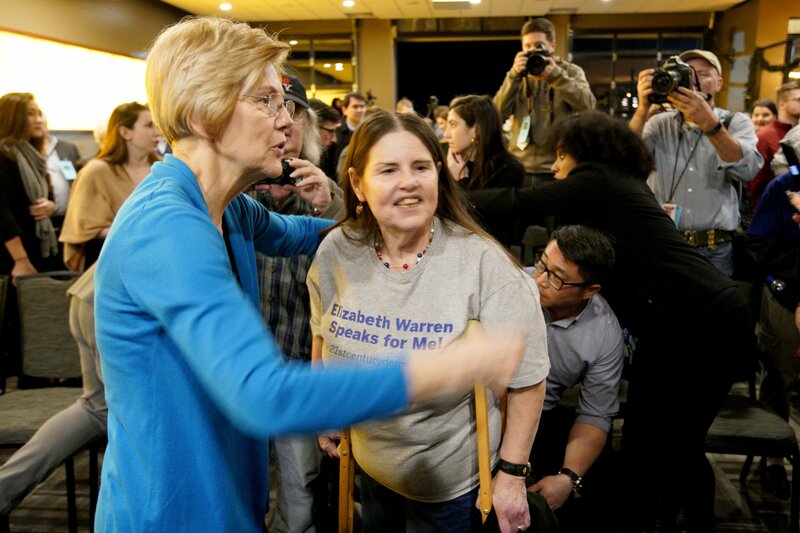 COUNCIL BLUFFS, Iowa — Democratic Sen. Elizabeth Warren of Massachusetts strode into Iowa Friday with all the look of a presidential candidate, igniting pent-up Democratic frustration with her brand of fiery liberalism in the premier caucus state. Warren made her Iowa debut calling for economic fairness in front of a cheering crowd of Iowa and Nebraska Democrats at a Council Bluffs, Iowa, bowling alley. She was scheduled to continue by holding public events Saturday and Sunday in western and central Iowa theaters, community centers and bars. Warren has been an emerging national figure for more than a decade as an advocate for consumer protection, now a senator and a regular target of President Donald Trump. But this trip offers the first glimpse of what the likely Democratic presidential candidate will look like in that role. She appeared to relish the transition from the outset. She also signaled a potential point of conflict within the Democratic primary field, suggesting billionaire candidates would not represent the party well if they used their personal wealth to help finance their campaigns. Billionaires including environmentalist Tom Steyer and former New York Mayor Michael Bloomberg are weighing 2020 Democratic candidacies. Steyer plans to visit Iowa Wednesday. Despite the friendly reception, retired teacher Carla Hawkins was far from ready to commit. Warren will have the chance to forge more personal connections with the state’s activists and powerbrokers, starting Saturday with about 20 Democratic activists at a private home in central Iowa and Sunday at a Des Moines cafe. “I’d like to see how she deals with people one-on-one, that interaction between her and regular folks,” said Jan Bauer, the Story County Democratic chairwoman, who planned to attend the private event with Warren Saturday. Though Warren announced the formation of a presidential exploratory committee Monday, Friday’s event had all the trappings of a full-throttle presidential campaign. Having recently named a team of seasoned Iowa campaign hands, Warren took the stage in the bowling alley bar to a typical campaign soundtrack of pop and classic hits. A team of private security guards guided attendees and the dozens of media through the parking lot. Warren’s staff logged the names and contact information for those interested in more information. Iowa’s caucuses, local political meetings held statewide and run by the party, are scheduled to begin the 2020 nominating campaign in February 2020.